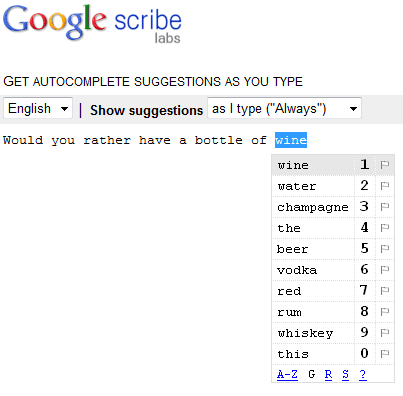 Google launched a very interesting tool that offers suggestions as you type: Google Scribe. It’s not exactly the service I anticipated 3 years ago, but Google Scribe works surprisingly well. For example, I started to type “This works sur” and Google suggested “This works surprisingly well“, which is exactly what I wanted to type. 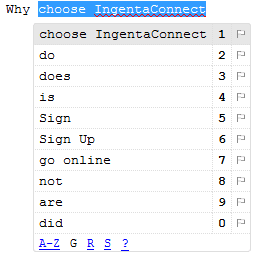 Instead of typing 14 characters, I could only type “1” or press Enter to select the first suggestion. “Google Scribe provides text completion service. Using information from what you have already typed in a document, Google Scribe provides related word or phrase completion suggestions. 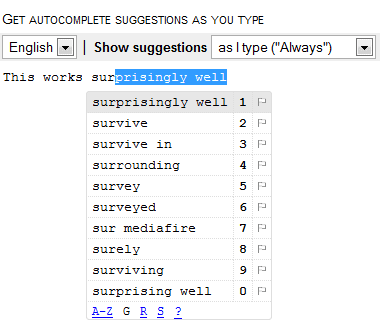 In addition to saving keystrokes, Google Scribe’s suggestions indicate correct or popular phrases to use,” explains Google. The nice thing about this service is that you don’t need to use Google’s editor. You can add a bookmarklet to your browser and use Google Scribe in Gmail, Blogger, Google Docs or on any web page that includes text fields. Google Scribe only works for English right now, but I’m sure that Google will add many other languages in the future. 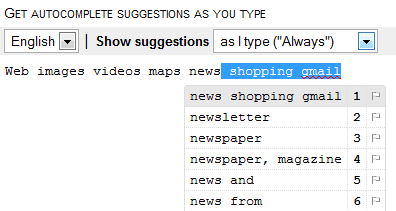 If you don’t like to see suggestions for all the words you type, enable the on-demand mode (Ctrl+Shift+J) and you’ll only see suggestions when you press Tab.